Tonight I was really in the mood for take-out from Chinese but I am trying to not spend a bunch of money before the Holidays. I loved my Better than Take Out Beef & Broccoli recipe so much that I thought I would branch out and give other Chinese foods a try. Better than Take-out Instant Pot General Tso’s Chicken Is the perfect hint of spicy and sweet and the chicken is so tender it melts in your mouth. Serve over rice and you will have the biggest hit in your house. I think I have a new favorite for the Instant Pot. I simply love how Instant Pot Chicken turns out. The sauce used in Instant Pot General Tso’s Chicken is spicy and sweet I can’t really explain how good it is. You can also Use your chicken from frozen that is how versatile the Instant Pot is. There are many easy Instant Pot Chicken Recipes I am on a mission to try them all and bring them to you. Try out my Instant Pot Beer can Chicken. 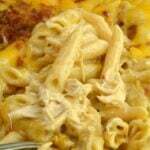 Chicken Pot Pie Casserole, or even my Buffalo Chicken Pasta. You can whip up Instant Pot General Tso’s Chicken probably faster than it would take to order take-out and have it delivered. This is better than take out, and the flavors are on point. You have big pieces of chicken that are covered in the spicy and sweet sauce that is just mesmerizing. The best part is if you forget to thaw your chicken, that is okay, you can use frozen chicken! Serve over a bed of rice, and Bon Appetite. Serve over a bed of rice or looking for a lighter option to create lettuce cups! Creating Instant Pot dishes that mimic our favorite take-out dishes not only saves me money and time, but I always know exactly what I am putting into our dishes. 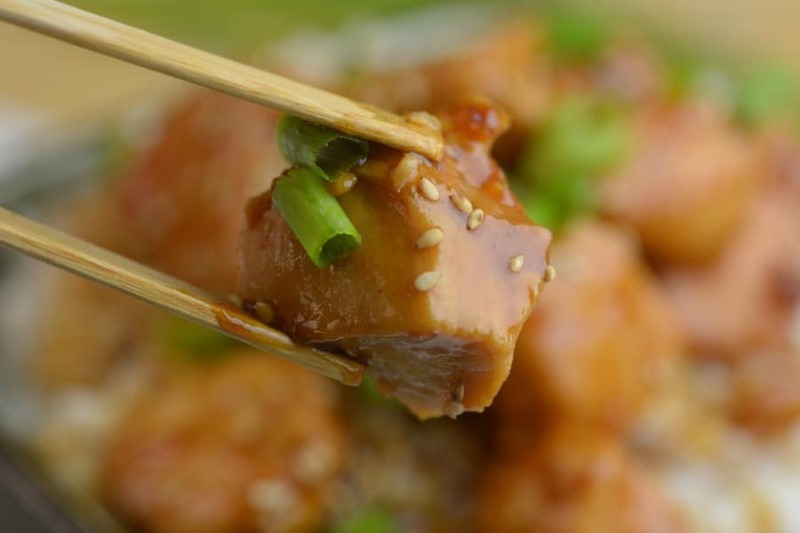 This better than take out Instant Pot General Tso’s chicken has become a family favorite from the first bite we took. You get the same flavors as you would from your favorite takeout, and you can find all the ingredients at your local grocery store. You would think this would be a difficult dish to make with all the flavors, but the Instant Pot makes it super simple. It wasn’t until a little bit later in life when I found my love of Asian and Chinese cuisine. It was like my taste buds matured and I was awakened to all the unique and savory and sweet flavors their dishes had to offer. I can’t seem to get enough of either of these cuisines. General Tso’s was one of my first dishes I tried that I really loved, that sweet and savory sauce that is smothered all over this chicken just blew me away. It offered just a little bit of spice, that had me craving just one more bite. It soon became one of my favorite take-out options. So when I began cooking and realized I could recreate a favorite dish of mine, I had to give it a try. With a few tweaks I then created this dish here, and I am so happy I gave it a try. Now we can have our favorite take-out dish without leaving the comfort of our own home. I don’t have to deal with a crowded restaurant or even getting dressed up to go out and I can stay in my pajamas or loungewear and relax in the comfort of my own home. Saute chicken cubes in sesame oil for 1-2 minutes or until chicken is white no need to cook all the way. In a separate bowl mix together Rice Vinegar, soy sauce, garlic, ginger, red pepper flakes, hoisin sauce, and brown sugar. Pour mixture into the Instant pot over the chicken. Place Manual High power for 10 minutes. Place your pot back on saute bring to a slight boil. Whisk in cornstarch until mixture turns thick and bubbly about 2 minutes. Serve over rice. Sprinkle with green onions and sesame seeds. ← Previous Post Health and Well-being Tips for Graduate Nurses. I was so excited to find a General Tso Chicken recipe for the Instant Pot, as my husband loves it. We made this dish last night for dinner and had a similar experience to Maxine and found it to be inedible. We think that the problem could be the quantity of hoisin sauce is too much? I’ve never had a recipe to call for that amount. Ours didn’t look anything like the picture either, but much darker in color from the sauce. the recipe above is exact to what I made. I am not sure what happened to yours. Perhaps different brands of hoisin sauce have slightly different/more condensed ingredients that makes them too strong in that quantity. Maybe? Mine turned out perfect using this recipe. I agree with Terry. I was excited to find a General Tso Chicken recipe for the Instant Pot. I made this dish last night for dinner and found it almost inedible. I was amazed by the quantity of hoisin sauce and luckily reduced it to 1/4 cup. My dish did not look like the photo either, The sauce was very thick and much darker. I found the sodium level for this recipe off the chart high and do not consider it a heart healthy choice. If, I make it again…I will modify and add low sodium chicken broth and soy sauce. How much hoisin was in 1st recipe! Made this tonight and it was delicious! Did more chicken than it called for and it was perfect. Definitely will be a repeat meal. 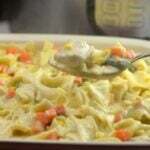 We made this recipe this week and the sauce was tasty but REALLY potent. We ended up adding a bag of frozen broccoli as well as some of the cooking water from the broccoli to tame it down a little. We enjoyed it, but without the addition of the broccoli I don’t think we could have eaten it. My Instant Pot arrived last week and this was the first recipe I tried. Very tasty. Just made this tonight and it was way too salty. The chicken was delicious but need to cut down on something in the sauce… the hoisin maybe?? The sauce was very strong. We had to kind of strain the chicken from the sauce so we didn’t get too much sauce. Might try to add less hoisin and soy sauce next time. Mine was also much darker than the photo. I made it also,but based on the comments,added less Hoisan. added orange juice and more brown sugar. It was yummy!!!! It was a hit! I made slight changes…added 1TB extra brown sugar, used low sodium soy sauce and slightly less than 1/4 cup hoisin sauce. I also used bone in thighs and legs. They were not quite thawed but still only cooked for 8 minutes along with quartered potatoes and baby carrots. Next time I’ll do 7 minutes. It was delicious! It was delicious, thank you for the recipe. My husband had two helpings and he can be picky. I’ll definitely make this a bunch! I made this tonight and followed the recipe except for using low sodium soy and increasing the ginger a bit because we are all ginger fanatics in my house. Also, I cooked broccoli on the side. I did not like this, I LOVED it! We all loved it. So much so that we were sad when the pot was empty. I will make this again very soon only I may have to double the recipe so we can all have seconds. This was awesome and was our favorite Asian chicken IP meal to date! I followed the recipe as written (used 1/2 thigh meat and 1/2 breast meat) and it was perfect! The only thing we might change is to add more red pepper flakes. I’m a spice wimp and couldn’t detect them. Of course, “heat” is a matter of taste. I served it over Trader Joe’s Jasmine rice (steamed in microwave) and added some steamed broccoli and carrots. Perfectly delicious! My partner and I both voted this one a keeper. For us, it was 4 servings, so we will have leftovers for lunch tomorrow! Thanks for a great, easy recipe! Ten minutes seems like a long time to cook cubes of chicken when a chicken thigh can cook on high in 9 minutes. Am I reading that correctly? We made this recipe tonight, but with the original 3/4 cup hoisin sauce. Agreed that it is too much, so we will try it again with 1/4 cup. I used chicken breasts, so next time will reduce the cooking time because the chicken was overcooked. Overall, a great recipe though! And we made the rice in the ip and it was perfect. Agreed. 10 minutes seemed a bit long. I doubled this and used 3 lbs chicken and 1/2 cup hoisin. Some of the cubes had fallen apart and the remaining cubes were a bit dry. May try 8 minutes next time you think? This is delicious though! My 2 sons went back for seconds and thirds. I had to make more rice, forgot to double that! Thank you for the wonderful recipe. I used powdered ginger, but may try fresh next time. Made this tonight for dinner. I was looking for a General Tso’s Chicken that could be made in the Instant Pot and this was the 2nd recipe that popped up in my web browser. I settled on this one for two reasons: the 1st all the ingredients were items I already had in my kitchen, and 2nd I did not have to bread the chicken. I added an extra garlic clove (b/c you can never have too much), and I used fresh ginger (I was not sure if it was supposed to be powdered or not), and I added a splash of Orange Juice when it was done cooking b/c it cut down on the heat a little bit (too much red pepper totally my fault not the recipes). This came out great. Everyone in my house enjoyed it even my picky eaters. It will definitely be made again. Thanks for the great recipe!! We luv Tso Chicken….luv our instant pot. This is on the menu for our Sunday dinner. Thank you for the recipe!! Love this recipe.. so good! You have quite a bit which is awesome. I did the minute steaks recipe already. The gravy was delicious. Our meat was tough but that was the cut of meat, not the recipe. My only request with your recipes is to be very specific for not natural cooks such as myself. I can follow a recipe but I can’t throw anything together. For example, when you say a 1/4 tsp ginger is that fresh or ground? I love your recipes and keep them coming! Just keep us noobs in mind when you write out the recipe! Thanks! Is the ginger supposed to be powdered or the kind in a jar (minced, I guess)? I’m planning on making this for guests this week. Is this very spicy or should I omit the red pepper flakes for my toddler? Also, does doubling the recipe affect anything? I just made this for the first time. It’s dreamy! Thanks so much! I normally stir fry lots of veggies, but only had chicken and onions so I tried this recipe tonight. There flavors were delicious together…I did have fresh ginger in my freezer and grated it directly into my instant pot. The only change was that I practically cooked my chicken so I only put it on manual for 3 min, used natural pressure release. I then mixed in the corn starch with 2 tbsp water to make a slurry. I left out the pepper flakes for the kids portions but added pepper flakes and sesame seeds for my hubby and me. Served with Jasmine rice. Next time I’ll double the recipe, not saute the chicken as long, and maybe add some bell peppers. I tried this for the first time and it was a hit with my family! I lightened the amounts of red pepper and hoisin sauce, and even my picky 8 year old son tried it and liked it. Lots of ingredients, but cooked easily and quickly. Thanks! These recipes are just wonderful. My wife uses Instapot and I will definitely recommend her to try out these recipes. Pictures look quite yummy. Was so excited to see this recipe and made it last night. Very disappointing. It was very dark and the hoisin sauce left very unpleasant undertones (almost like a burnt taste). I will leave it out next time. It didn’t taste like any General Tso’s I have ever had. Needed a bit more heat and, but maybe my McCormick’s red pepper flakes weren’t potent enough. Now I’m just trying to figure how to fix it. I followed the recipe exactly. I made this tonight and it was delicious! I’ll definitely be making it again. I made this tonight for my husband and I, halved the recipe initially but ended up using 1lb chicken breast, 3 garlic cloves and doubled the red pepper…it was perfect. Served over traditional sushi rice in my Zojirushi. It doesn’t seem like much liquid. I have an 8qt. Do I need to add more liquid? No, there is no need to add water. I made this in my 8qt. and followed the recipe as it’s written and it came out great! Do you need to drain the chicken after sautéed?? I had the same issue with my 8. It came out crazy thick and wouldn’t pressurize. Just follow the recipe as it’s written and there is no need to add water. There is plenty of liquid in these ingredients for your pot to come to pressure. Made this tonight and it was delicious! Made exactly as recipe stated, did make a lot of sauce though, even using 1/4 c hoisin. Would be good with added broccoli. Will make again! I made this and we thought it was very good. This recipe will be one that will be made again and again! We thought it looked just like the photograph! Made this recipe tonight for my family. Didn’t change anything and it was perfect. My 8 yr old loved it , I was scared the red pepper might make it spicy but not at all. It was perfect and a quick dinner ! Thank you so much for you’re great recipes! How do you double the recipe? I doubled it and went to 15 min cooking time. All proportions doubled and worked great. Also paired well with a simple sauté of cabbage, carrots, red onion. Added on top of the rice then chicken and sauce. Are leftover chicken and sauce good frozen? Made this last night (with correct amount of hoisin) and I thought it was just so-so. We added broccoli (note – don’t cook the broccoli with the chicken, it disintegrates), but it needed more – maybe chunks of onion, red and green pepper. We even added red pepper flakes, less sugar and a splash of orange juice which all added good flavor that you could taste, but it was still just a little off. Not sure why. I will try again and add some other ingredients. Is that powdered ginger or fresh? I used a prominent brand of hoisin sauce, and the results were disappointing. That brand has a prominent “5-spice blend” flavor which i dislike a lot, and does not taste like any General Tso’s I’ve ever tasted. Wish i had known. Anyway, looking forward to trying this again with a better hoisin! What if you have frozen chicken breast? This was delicious! My only comment would be to list the ingredients the way recipes should be written. Which is the order in which they are used. I had to go back and forth to find the next measurement way to much. This is causing the user a lot more work than warranted. Thanks for sharing all these great recipes! I am an IP-neophyte and excited to get comfortable with my new kitchen “toy”. One question — you mention using frozen chicken (which I tried last night cooking alone last night and it was awesome!). I’m wondering how that would work with this recipe. Since you can’t follow the first few steps of the recipe, would you instead just cook as the frozen chicken “brick” along with the other ingredients and ignore the dicing and the cooking until white? Wouldn’t I need more liquid than the recipe calls for in order for the chicken to thaw and cook through? Delicious ?? ?Family loved it even husband who is a fussy eater !!! Cheers Carol . I followed the recipe as written (used LaChoy Soy Sauce and Kroger brand Hoisin sauce). 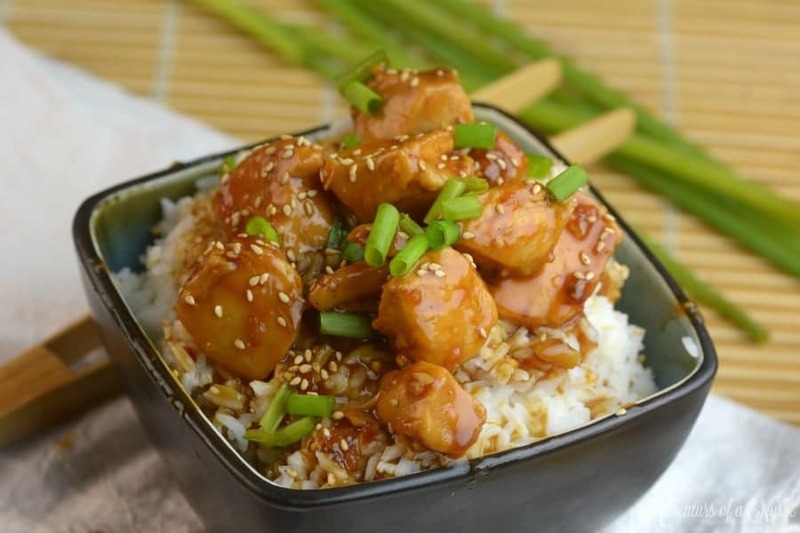 Itwas easy to make, had a great flavor and my family really like it; however it did not taste like general tsos…at all. Definitly did not looke like the photo. It was a tad salty and not spicy at all. 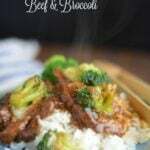 I served it over rice which tamed the salt and steam broccoli on the side. 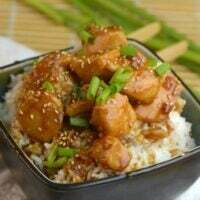 I am still looking for a good IP general tsos recipe, but will probably make this again. Hello i wanted to give your recepie 10 out of 10. Single man here followed the recepie exactly and it was very very tasty.., i don’t understand why some people have issues it works flawlessly and is so tasty. I pimped up the rice with one bell red pepper mushrooms soy and one egg. One question what are red chilly flakes? I used red chillies and was hot but very tasty. I ll try alk your other recepies. And by the way i m planning to freeze the other 3 portions for my mid week meals. Instant pot rocks! How do you prepare this with frozen chicken? I made this last night and it was quite good. I used a little less soy sauce and a little more pepper flakes. I also added some dried orange peel and white pepper. My son said this is now one of his favorite instant pot meals. Thanks for the recipe! I am new to the IP and am looking at making this tonight. Would I be able to add rice to this to make it a one pot meal? And if so, how do I adjust the time/liquid? Delicious. Increased the garlic by 3 and used a mountain sauce instead of soja. Even a 3 and 5 year old enjoyed the dish. No leftovers! When you say one garlic, do you mean one close behind? Or the whole bulb? Hi! This sounds delicious, but I have yet to make an Instant Pot recipe, so I was wondering if you have to stir during saute, and what does “instant release” mean? This is very similar to my recipe. The only thing I do different is I use about half of the amount of Rice Vinegar, I coat my chicken in the cornstarch first and then saute chicken and add sauce. Before I had my IP I made this chicken in a crock pot and it took 3-4 hours so this recipe is my go to when I’m craving chinese and I have yet to find a better one online. How do I adjust this for frozen chicken? Thanks!! Sounds delish…but with such a little amount of liquid, will it be enough to bring the IP to pressure??? My husband LOVES Gen Tsao and I can’t wait to try this. Can you tell me what is “1 garlic”? Is that one clove? These recipes are just wonderful. Pictures look quite yummy. Does the calorie count include the rice?? I made this for dinner tonight, and, because we tend to be a little more bland in our taste buds, I reduced the amount of hoisin in the recipe to even less than a quarter cup. I also added some snow peas and asparagus to get in some vegetables, and it turned out great. I will definitely be making this dish again. Thank you for the recipe. Yum Yum! My first Instant Pot recipe and it turned out great! I followed the recipe exactly, except for adding broccoli. Next time I will add more broccoli and throw in a few water chestnuts before serving. Thanks! Can you cook the rice at the same time pip? Roasted or unroasted sesame oil? I recently bought an instant pot and I tried this recipe and it was very tasty and my family loved it. This was one of my first dishes made in my IP – I doubled the garlic and red pepper flakes, results were delicious! Family liked the recipe. After Saute, cooked 2# cubed chicken breasts for 5 minutes, NR for 5 minutes, then QR. Chicken was done and tender. Thickened sauce with cornstarch. Recipe isn’t exactly like restaurant style but good. I just see 1 garlic. Does that mean 1 clove, 1 teaspoon or something else? Looking forward to trying this tonight.